Summer is a funny time for an ecologist. As a student, my classes have all wrapped up (I’m actually all done with class now, forever!!). My social media is full of people’s summertime adventures. My partner, who teaches communications courses at community college, is in full on vay-cay mode. Me? This is my busy season. I have been up to my eyeballs in marsh mud for most of the month, and for the month before that I was prepping. 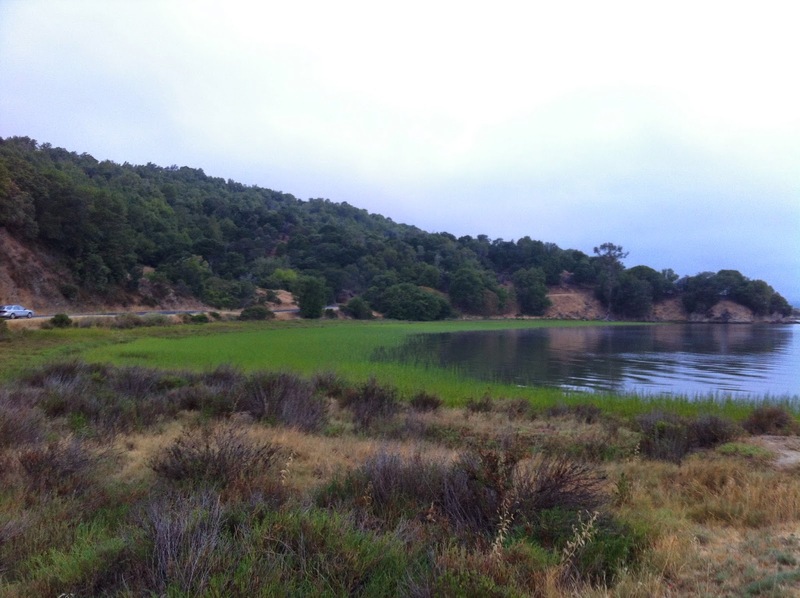 China Camp State Park. Maybe my favorite site. Ah, the field season. The first day of the each sampling period, I’m always a huge stress ball. By the time I visit my last site, I feel like Queen of the Marsh. One thing I always do to minimize my first day jitters is prepare a packing list for each project I’m working on. This helps minimize those “Oh crap, I left that sitting on the lab bench” moments. This packing list is mostly full of project specific items (thermometer, pH probe, redox meter, etc.). In addition, I have a mental checklist of things I never like to don my waders without. 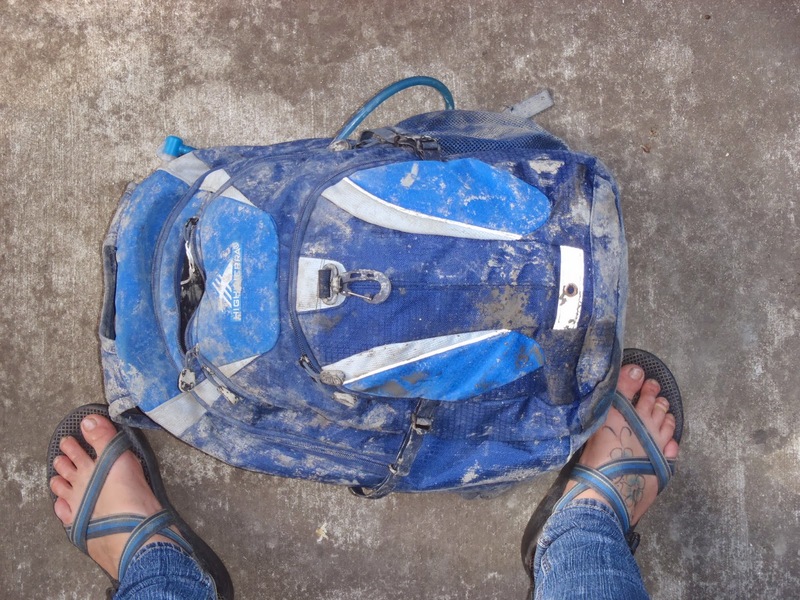 These items reside in my trusty field bag, and today I’m giving you the grand tour! Most of the things in my bag are things I find randomly useful, or things that keep me safe and comfortable while working. There are a few absolutely, 100%, totally essential things in my bag. 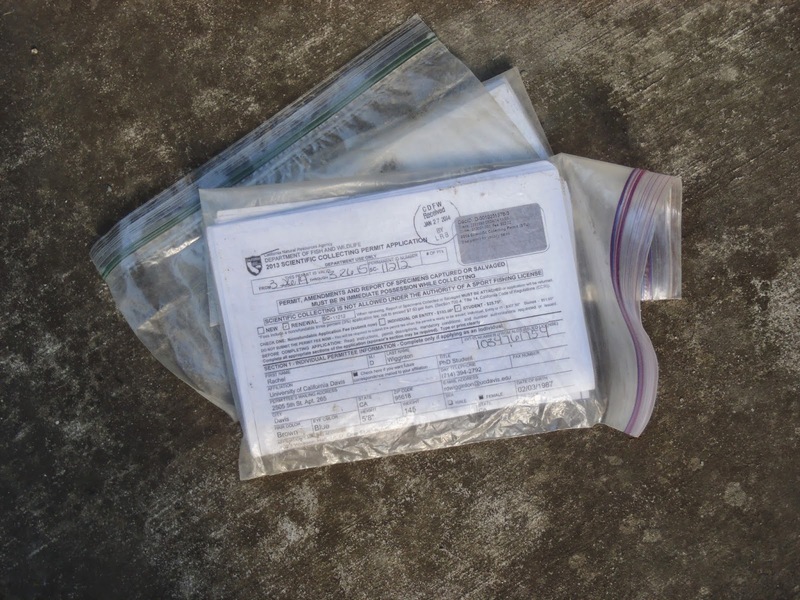 All my official permits live in their own protective plastic baggie. I’m not trying to become a marsh bandit, so I want to have proof of my officialness. 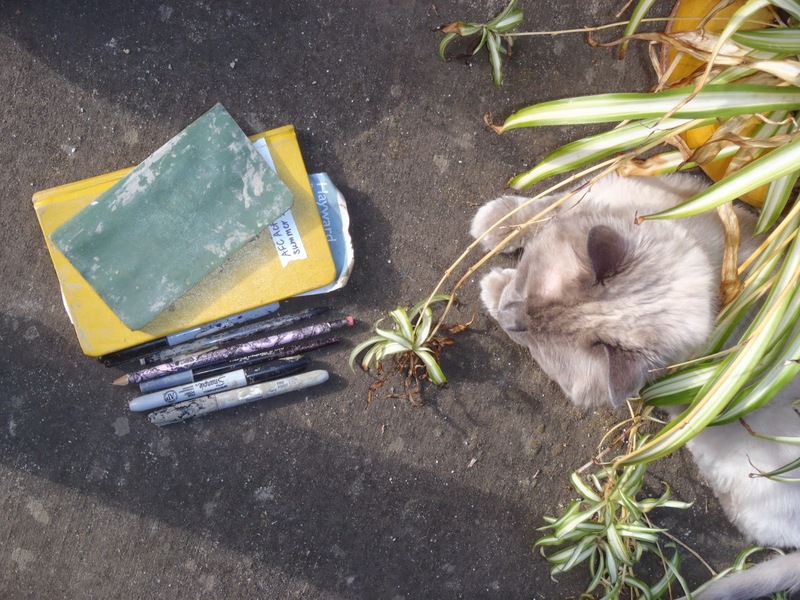 Next, for those just starting their ecology journey, field notebooks are your friends! I have two, both made with write-in-the-rain paper (necessary). You can even buy special write-in-the-rain pens that will write on the paper under water. My former lab mate and I may or may not have spent a good 20 minutes doing this in the sink when I was gifted one of these pens. Pencils work too, and you should have several! Also, permanent markers. Always, always, permanent markers. In case you can’t tell by the state of my bag, I work in the mud. Mud means water. In addition, my muddy water is salty. So, even though I don’t bring anything out into the marsh that I’m not willing to risk destroying, I like to take a few precautions. 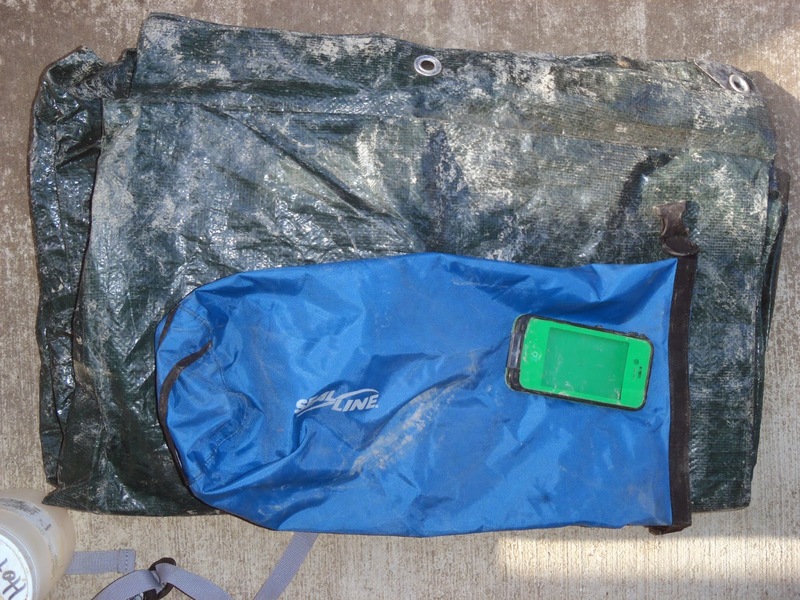 A tarp allows me to place bags and equipment on the mud, not the vegetation, but keep them clean and dry. I purchased that blue dry bag when Meridith and I were about to hike the Narrows at Zion National Park. I usually keep my lunch in there, but it’s just a good thing to have on hand. 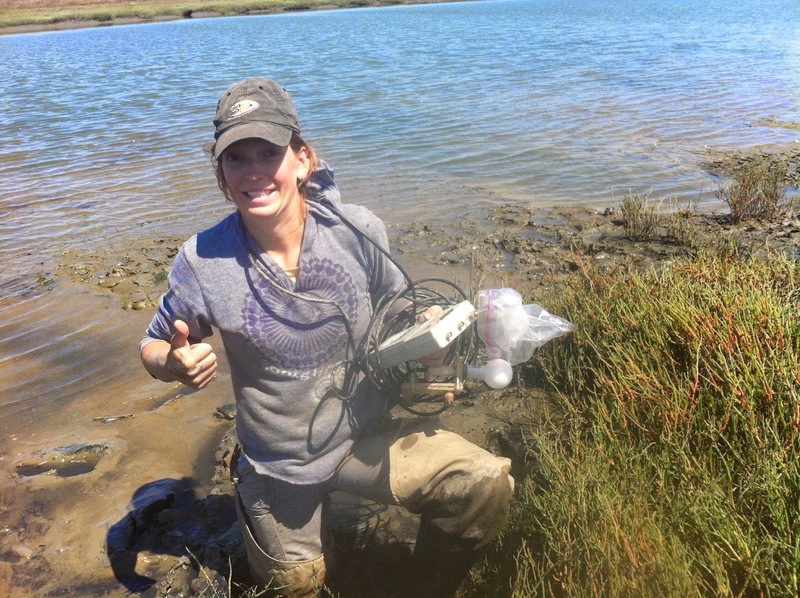 Occasionally, one of my undergrad crew will realize they tottered out on the mud with something electronic, and I’ll toss it in there for safe keeping. On top, you’ll see my Lifeproof iPhone case. I always bring my phone into the field with me for safety reasons. Also, marsh selfie reasons. I’ve been really happy with this case overall, though it does make the keypad a bit less sensitive and it can make charging difficult, depending on the charger. Thus, I have a non-field case for daily use. Apparently you can literally dip this case in the water and take phone pictures, but I just can’t live that life. I think my camera itself also fits in this category. I sport an Olympus digital camera. This sucker is shockproof, waterproof, freezeproof, and dustproof. Basically, Rachel-proof. I bought an older version of the camera I have now when I broke my previous digital cammy by dropping it from a height into water. I’d say each one I’ve purchased has lasted about 3 years. Not trying to give a product review here, but that is three years of snorkeling, being dropped on the floor of canoes, hiking up mountains, and generally marinating in mud. They aren’t the best cameras for capturing vibrant colors, but I’m still a huge fan. The next group of things living in my bag are there to keep my happy and safe during the whole day. My Platypus hydration bladder was also purchased when Mer and I were on our road trip. This system makes it easier for me to carry enough water to actually stay hydrated all day. A water bottle or two just doesn’t cut it for 7 hours of physical labor. 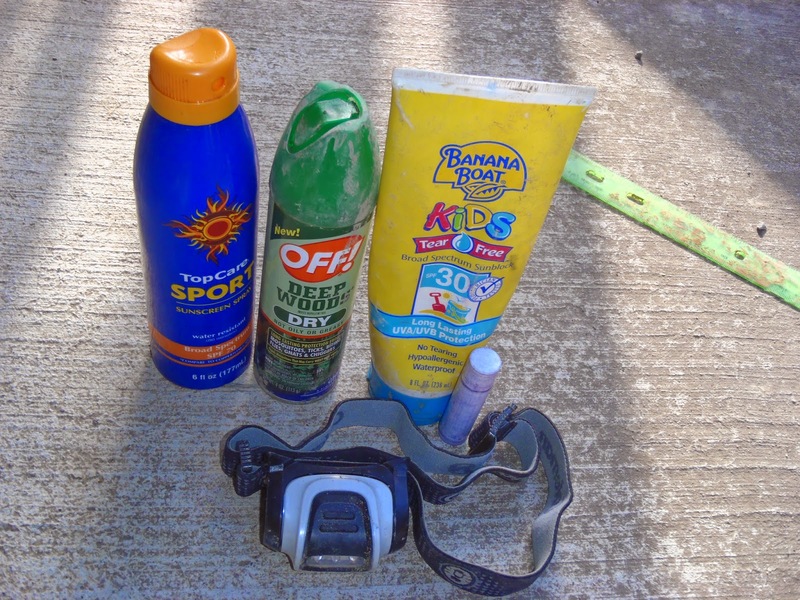 Sunscreen is also essential for a long day. I usually have the lotion kind to apply first thing in the morning and the spray kind for reapplication when my hands are covered in mud. It’s also a good idea to have a chapstick with sunscreen in it, as the skin on your mouth can easily get burned too! Bug spray, enough said. Mosquitoes love me, but it’s not mutual. The first aid kit I’ve put together is by no means extensive, but I think it has most of the essentials. I love the spray antibiotic ointment (thanks Meridith’s mom!) especially. It’s good for after you have a chance to wash off, usually in a gas station bathroom, and you notice all the wee cuts that were covered in dirt. I also always have a headlamp with me, just in case. The last, and maybe most awesome, thing isn’t pictured…because I thought that might be weird. This is a lady specific item, called the p style. Basically, it allows women to pee standing and without having to totally drop trow. This is 100% amazing for me as I work in a system with zero trees, and my sites are often ringed by running trails. Maybe you think it’s weird, but don’t knock it till you’ve tried it. My sister, who hiked ~300 miles of the AT last summer, was gifted one by yours truly and told me it was amazing to be able to pee without having to take off her heavy pack each time. You’ll thank me for this one day. This is the category of odds and ends things that I often need, but I’m never really sure what I’ll need them for from one day to the next. These are maybe a bit specific to my own work, so I’d love to hear from other scientists about the odds and ends that are always randomly helpful to them! I carry a trowel for digging up things. 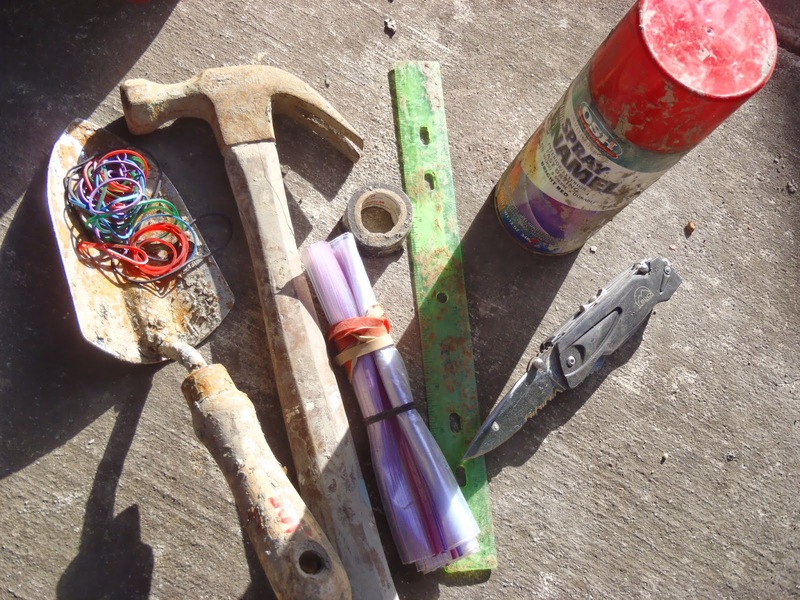 I also have a hammer, usually for banging PVC into the ground. Spray paint is great for marking the ends of the PVC that show where your study areas (transects, blocks, etc.) begin and end. White PVC seems so visible when you first put it in the ground, but when you come back months later and the grass has grown, and your PVC is dingy, a little red spray paint can really help you find things. Rubber bands (or zip ties depending on what you have), extra ziplock baggies, tape (electrical pictured, but duct tape is awesome! ), and a ruler are great things to have on hand. I literally cannot even list all the uses of these items. Last, I think every person who works in the field should own a good knife, preferably a multitool. Seriously, so many uses! Lasty, there are a few things that are sometimes in my bag, but usually just on my person. I almost always wear a hat or a bandana. I also generally have on polarized sunglasses. Your retina can get sunburned too! Additionally, polarized lenses help you see through glare. Layers are essential as well. Even in the summer I have a tank top, a light shirt, a long sleeved shirt (or sweater in the cooler months), and a waterproof layer. Last, always always wear a watch. You need to know when the tide will be coming back in, or how long till sundown, or how much longer to leave that instrument in place to get a reliable measurement. A waterproof watch with seconds displayed will only cost about 20 bucks, and it’s totally worth it. I’m not kneeling, I just have one leg sunk in mud up to my knee. Shew, so you have gotten this far and you are now wondering “Holy crap, Rachel why do you carry around so much stuff? !” True story, one time I got lost in the woods. My little sister, my college roommate, and I went on a short hike that turned into a 15 mile hike. It made an impression on me. While lots of the stuff detailed above is to help me with my work, there are a few things that I now refuse to go without if I plan to be outdoors for more than an hour. 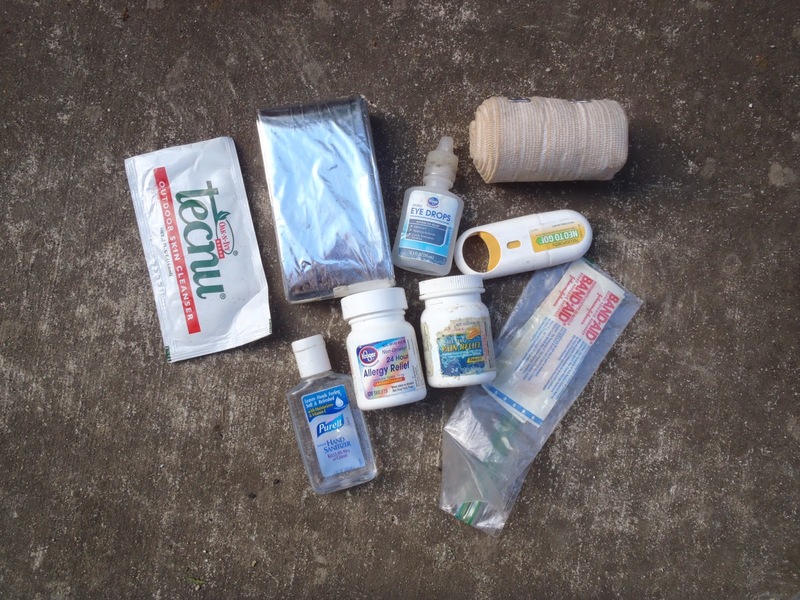 So, for those who maybe aren’t as obsessively over prepared as me, here is the Reader’s Digest Version of what I think must go in your field bag/day hiking pack. – Your phone. Maybe you won’t have service, but maybe you will. And there you go. A full tour of the inside of my field bag! I’d love to know what you keep in yours. Any hikers or backpackers out there? What do you refuse to venture out without? * True confessions. I adore both lifestyle and mommy blogs. Sorry, not sorry. Previous Previous post: Ten Tips for Tackling that Thesis!